The Shaman Spirit has been unveiled! This is an interesting card that definitely needs some thought for the deck you need to build around it. 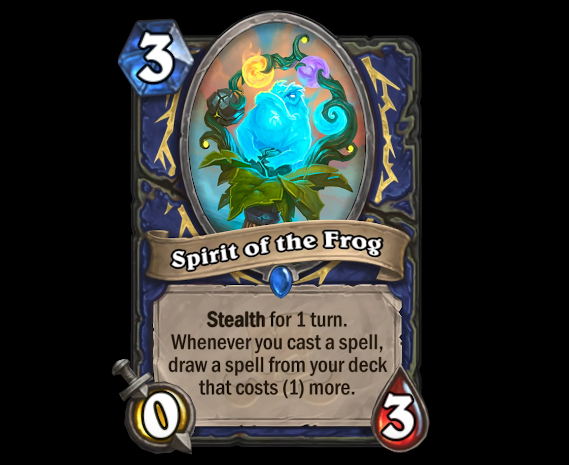 I wouldn't expect Spirit of the Frog to chain draw spells (which is the first impression everyone gets from this card), because it requires a lot of setting up and it needs to happen quite late in the game already (the 3 mana cost is also slightly on the expensive side). This card's best usage is as a tutor, for example, Hex fetches you a Bloodlust and so on. So, it's more likely we see this in Control decks than burn ones. You never know, though: there might be a midrange deck using this and Zentimo. You can find all the revealed cards in our Rastakhan's Rumble expansion hub. This is interesting. the controlled nature of its card draws makes it better than you would expect.